Mixhouse Vs. Anna Ritsmar. Extended Starlight by Jonas Mix Larsen. 17 year old Anna is the youngest in this year’s heat, but she is no stranger to the Danish TV audience. In 2016, she took part in X-Factor where she reached the so-called 5 Chair Challenge. She is a high school student, but has put it on hold to focus on her music projects, the Danish final and two bands she sings in. Starlight is written by Lise Cabble. 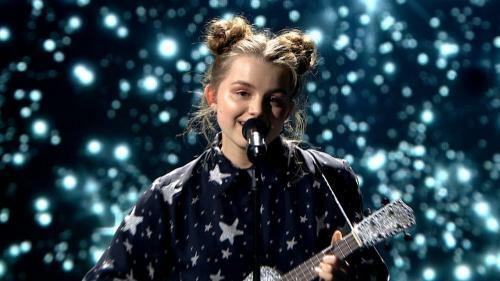 She is also involved in song number one, but contrary to her 13 previous Danish final entries, this is the first time she is taking part with a song completely written by her. Three of Lise’s 13 songs have won Melodi Grand Prix and made it to Eurovision – and all finished in top 5. First one was Fra Mols Til Skagen in 1995 (5th place), then New Tomorrow from 2011 (5th place) and Emmelie de Forest’ Only Teardrops winning entry from 2013.